Poll shows party founded by Ariel Sharon to carry out the 2005 retreat from Gaza may not make it into next Knesset. A poll published Wednesday shows that Kadima – currently the Knesset's largest party with 28 seats – may not even make it into the next Knesset. The poll, conducted by the Smith Institute for Globes, gives Kadima just three seats – receiving just above the bare minimum of votes required for passing the threshold for entering the Knesset. If Kadima's downward-spiraling trend continues, its demise in the next elections may mark the most radical disappearance of a political force in Israel's history. 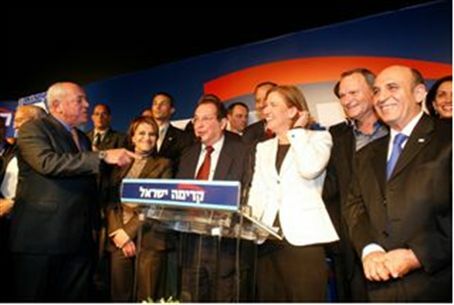 Other parties have come and gone, but no party went from 28 seats to none in the course of one Knesset term. Kadima was founded by then-Prime Minister Ariel Sharon to facilitate the 2005 "Disengagement" – Israel's complete and unilateral retreat from Gaza and northern Samaria, which involved the destruction of flourishing communities and the eviction of thousands of Jews from their homes. Sharon is comatose following a stroke he suffered in January of 2006. The poll also shows that popular Communications Minister Moshe Cachlon's departure does not have a grave impact on Likud's stature. Cachlon reduced the mobile phone bills for Israelis by opening the field to competition. Likud would receive 27 seats if elections were held today, the poll determined – just one seat less than in the previous poll. However, the survey also finds that if Aryeh Deri is appointed to head Shas, the party would receive 13 seats as opposed to 11 under Eli Yishai. These two seats would come at the expense of Likud. Labor receives 18 seats in the poll, and Yair Lapid's Future party gets 14. The religious parties, together with Likud and Lieberman's Yisrael Beitenu, would have a 68-seat majority in the Knesset, more than they currently possess.